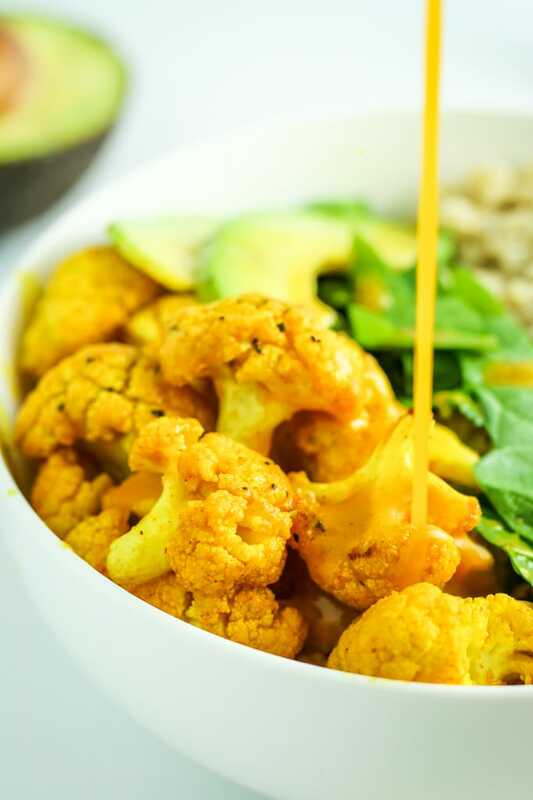 This turmeric cauliflower quinoa bowl recipe is easy to prep and super filling. It’s made with quinoa, turmeric roasted cauliflower, greens, and crunchy chickpeas, plus a delicious homemade vinaigrette! 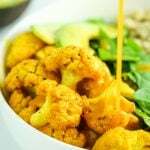 Remember the other day when we made turmeric roasted cauliflower? And it was bright and colorful and healthy and TASTY? Oh yeah. We’re taking that cauliflower and building a whole meal around it. I know from experience that you guys love quinoa bowls – and by experience I mean this quinoa bowl recipe is in the top 5 most popular recipes we’ve ever shared. The concept behind this recipe is super simple. Roast cauliflower and chickpeas. Cook quinoa. Portion greens. Mix dressing. Combine in a bowl or meal prep container. Store. Enjoy. 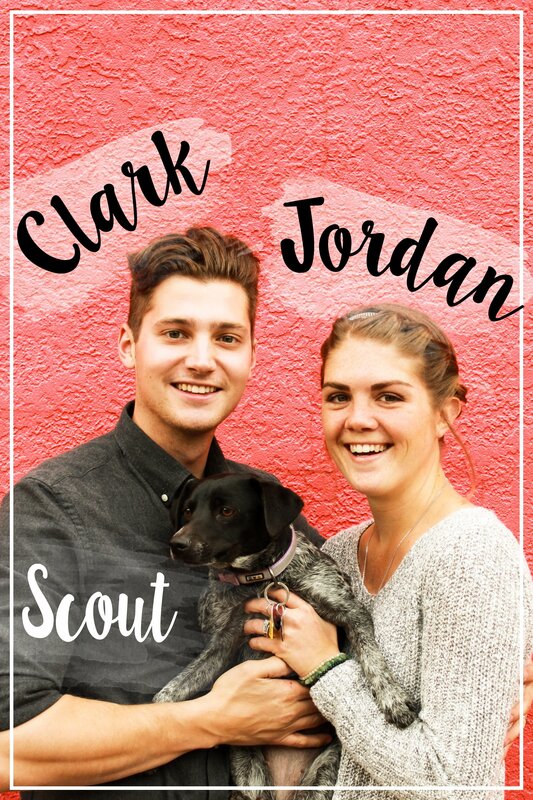 Minimal prep, minimal mess, minimal cleanup. Lots of flavor, lots of nutritional perks, and lots of fuel. Preheat oven to 375º and line a large baking sheet with parchment. You may need to use 2 if your pans are on the small size. Add cauliflower, oil, turmeric, ginger, and salt to a large ziplock bag and shake to combine. Try to get the cauliflower as evenly coated as possible. You could also mix everything together in a large bowl. Spread the cauliflower on the baking sheet, making sure not to crowd. Leaving some “breathing room” between florets allows them to bake more evenly. Bake 30 minutes, removing halfway to stir/flip the cauliflower. Line a baking sheet with parchment. Preheat the oven to 415°. Drain and rinse chickpeas. Pat them dry with a paper towel. They should be slightly damp – not sopping wet. In a large bowl or Ziplock bag, combine oil, garlic powder, sea salt, and pepper. Add the chickpeas and mix until well-combined. Empty the chickpeas onto the baking sheet and spread them out. Try to situate the chickpeas mostly together in the center of the pan. Outliers have a tendency to burn. Bake for 25 minutes, tossing every 5 to 7 minutes. Combine all ingredients in a mason jar and shake vigorously to combine. This recipe makes between 3 and 4 meal prep “bowls” or containers. 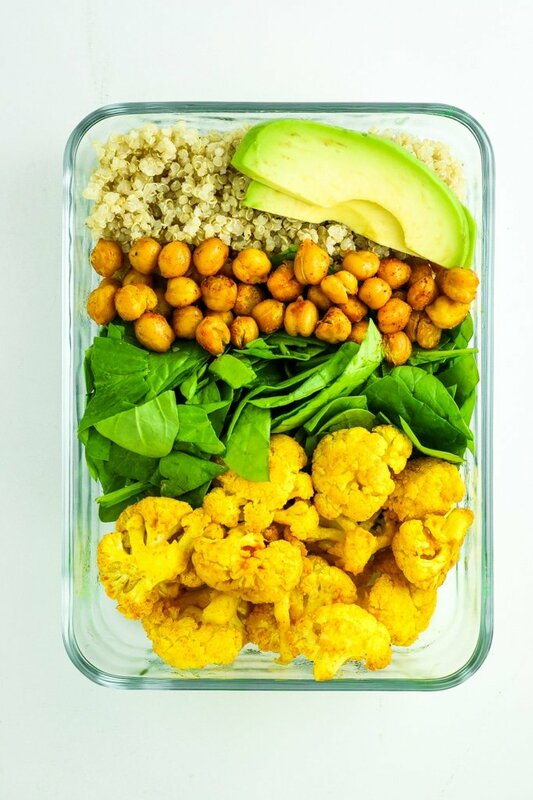 Divide the cauliflower, chickpeas, spinach, and quinoa equally between containers and store in the refrigerator. When you’re ready to chow down, drizzle the turmeric dressing over top and enjoy! This recipe is super customizable. You can add other veggies in with the cauliflower. Use a different type of greens. Leave out the chickpeas. Swap out quinoa for rice. Whatever your heart desires! I love these quick, nutritious meals. Anything with roasted cauliflower is a win.